Reservations were made and off we went to Taipa to lunch. Those with insider knowledge or Macanese connections will head to Taipa for some great culinary experience. 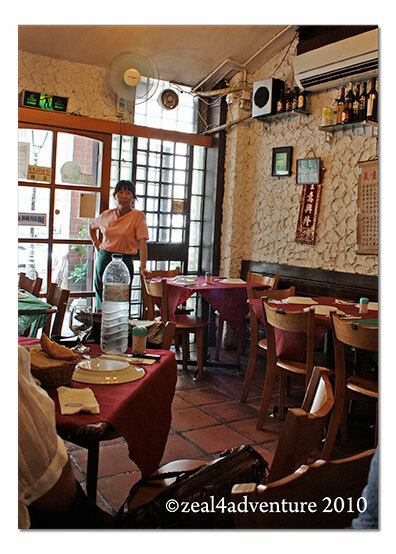 Tucked away in a quiet street just on the edge of Taipa Village is one of Macau’s best-kept secret, a homey, welcoming hole in a wall called O’ Manel or more formally known as Manuel Cozinha Portuguesa. Manuel Pena, a Portuguese and his Chinese wife owns this tiny restaurant that serves fantastic Portuguese food. In his restaurant, Manuel waits on tables himself, supervises the preparation of the dishes and does the cooking himself, sometimes with the help of his wife. There are no menus only a blackboard; in it written are the specialties for the day. 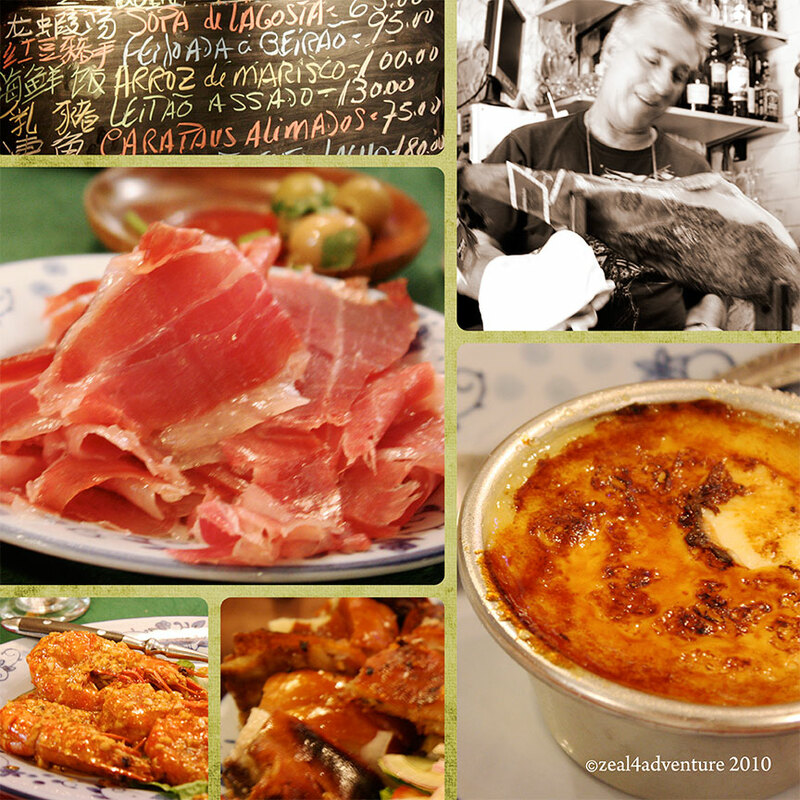 Clockwise: menu board; Manuel Pena and his Pata Negra; Caramel Creme; Roasted Suckling Pig; one order of Pata Negra, sliced. For starters, we had slices of Pata Negra (or jamon iberico in Spain), a favorite since I first tried it in Seville years ago. So memorable this Pata Negra was during my first visit to this restaurant some 3 years back, I came back with that in mind. Fresh fish and shellfish are found on virtually every Portuguese menu and it is not surprising that we were served Garlic Prawns and a wonderfully citrus Clams in lemon sauce with a hint of coriander. Roast suckling pigs, popular in the north of Portugal came highly recommended. We were ecstatic that it was perfectly roasted with skin that crackled so loud we ordered one more. 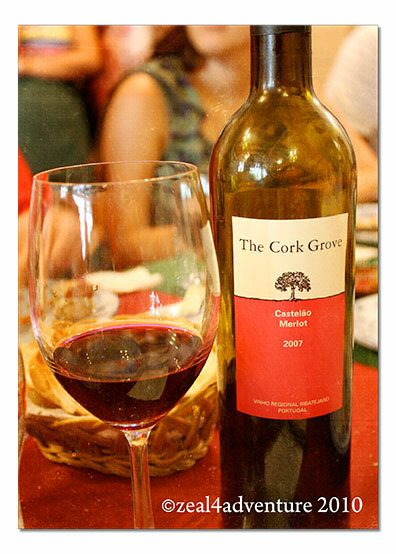 We washed all these down with a glass or two of this lovely Portuguese Merlot and capped this splendid meal with a most typical Portuguese dessert, Caramel Cream. Mmmm… overindulged, most definitely. 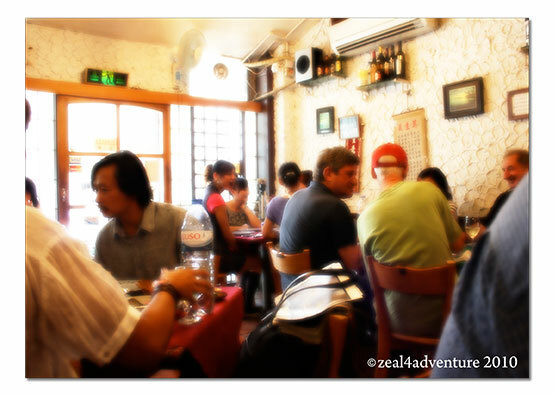 This small casual restaurant with its limited number of tables fills up quickly so book ahead. Thanks for a peek at a small corner of the other side of the world – fascinating! Hello Jenn! I am so glad you left a comment on my blog because I have enjoyed coming by to visit with you! I have read your “About” and “Why This Blog” and am so happy to meet you and learn of your amazing outlook and travels! Oh, stop, you’re making me ravenous – that food looks absolutely delicious. Great photos. It looks like a great find for non-vegetarians. I’d order the Creme Caramel.